Eschew the tourist crowds and head to Cavallino Matto and Food Tours. 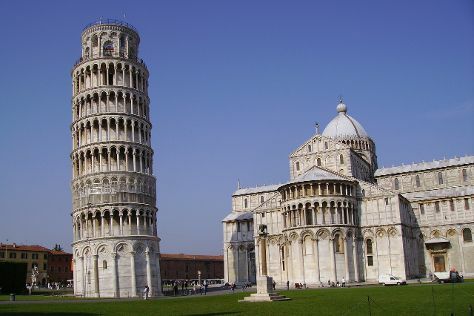 Change things up with these side-trips from Lucca: Santuario Madonna di Montenero (in Livorno), Dog Beach (in San Vincenzo) and Torre di Pisa (in Pisa). Make the 8th (Thu) an unforgettable day with an extreme tour. Next up on the itinerary: make a trip to San Gimignano Bell Tower, relax in the rural setting at Castello di Verrazzano, contemplate the long history of Camposanto, and get into the urban bustle at Comune Di Certaldo. To see more things to do, maps, ratings, and more tourist information, use the Lucca travel itinerary creator. If you are flying in from United States, the closest major airports are Pisa International Airport, Peretola Airport and Bologna Guglielmo Marconi Airport. June in Lucca sees daily highs of 80°F and lows of 60°F at night. Finish your sightseeing early on the 10th (Sat) to allow enough time to travel back home.